The name may change at some point. This will be a simpler version of a project I've been wanting to come back to for a while now, sort of a demake of the original game. 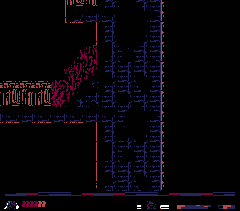 It's mostly inspired by Super Hydlide/Hydlide 3 which had somewhat abstract and busy tiles that always felt very interesting to me. So I tried to mimic that style. 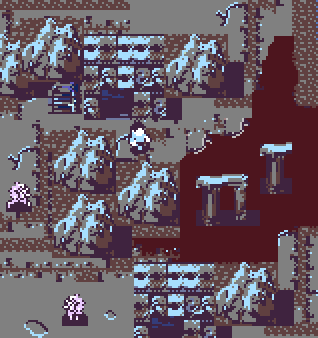 Some of the palettes above were mockups using random color filters I tested early on, I like how some of them turned out. 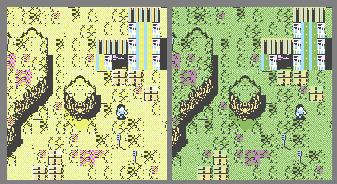 Here it is with and without a crt-like filter which I may include as an option. 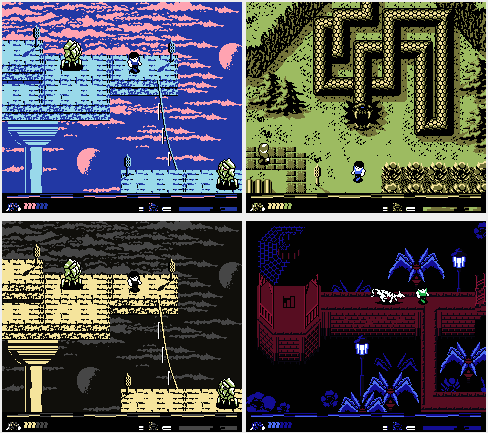 Here are some of the original omen mockups I posted at various times in the past. I'm going to try to incorporate ideas and bits of graphics from this version into the demade version above. I'd still like to come back to this original version at some point as either a sequel or remake or just as something similar with a different name. The snake statue in town for example will be the added to the demade game most likely as the first dungeon along with the gazebo and various other ideas. 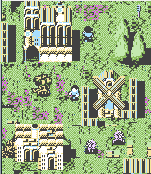 Here's a related mockup for an overworld map. 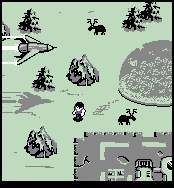 Again I'll probably try to use ideas from this as well or make it it's own game at some point. You have so many projects and they all look so good it's not fair. QOG - Thank you very much! I'm trying to get the basics done and over with first before I get back to the art. That's what I did with seas of saturn for the most part which made it easier to get it to a releasable prototype state. I started with collisions, screen transitions, character animations. So far it seems to work well enough, I can always tweak it later on. Next I'll probably animate those enemies and start working on the combat. Been a bit busy but I've been making bits of progress here and there. Experimented with more tiles for buildings and trying to figure out how I'd want the interiors to look. I still want to see if I can add a bit more color to the indoors though. 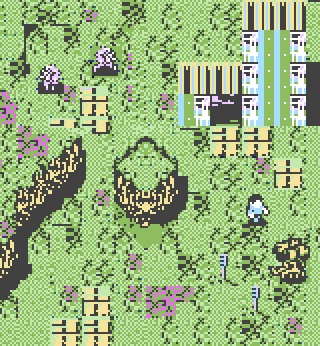 I want to also continue to make a nice variety of tiles for other types of houses for the town. The large jars are a little basic so I might add some kind of detail to them. I also got all the music ready that I plan to use so it's nice to have that all set. Thanks guys I really appreciate the comments! Here's a building I made earlier today that I'll probably use as a library for the main town. I really liked the aesthetic and then I realized you're also doing Deep Greens and Distant Valley and I thought, "Oh, of course it looks great." I always get stuck when I try to play Link's Awakening. What is it about that one that people tend to single it out over other early Zelda games? Isn't it aesthetically/mechanically pretty much like the Oracle games? As for awakening, In general I think music has a big part of what makes something nostalgic. The wind fish theme and many other tracks were beautiful, mysterious and set a perfect mood that sticks with you and makes you want to come back to it. The main zelda theme itself is an example of that and the wind fish theme is probably as good and memorable, it could very well have been a theme for it's own series, so to have those both in one game is very powerful and makes it stand out. Starting in a town with a chain chomp bouncing about and a dog house you can enter with a tiny chain chomp you can talk to already gives the game something memorable right at the start. Then later you finally get to rescue it and take it around with you on a leash which was great. There's a dream shrine with only a bed, that also stood out. The dark mysterious vibe you get from the southern shrine when you find a plaque explaining the island's origins with music that's very effective. Overall this gives the game a unique charm to me. The idea of a "wind fish" inside of a giant egg on a mountain is just very intriguing too. The gameplay, map and dungeon designs were all very good too. Seasons and ages were both good but it did some strange things, music was sometimes a hit or a miss, dungeons were filled with mine carts that felt a bit off/out of place when it comes to the atmosphere of the game. They had some great moments and music too but it just wasn't as solid as awakening I think. Also there were some very tedious things that gave it less replay value (mostly in ages). I should go back and play those games again though, I do really like them. I guess the oracle games just kind of felt off, kind of non-zelda like a lot of the time. Not as balanced or consistent as awakening maybe? Although people being so passionate about awakening probably makes the game seem overrated. It's just a very well crafted game and was a lot of peoples first zelda experience, but I just wanted to elaborate on why it personally stood out to me. Update: Thanks to you I found the motivation to push through the Link's Awakening opening sequence one more time... only to lose my save data all over but then I found more motivation again, and played through the first dungeon all over after I was 100% sure the emulator was saving properly. Lol. I'm past the 6th dungeon now, and I do have to admit there's a lot to love about it. It's pretty bonkers. 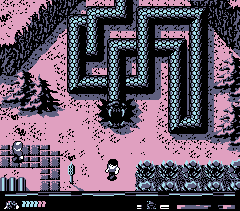 One thing about Link's Awakening and other old Zelda/Metroidvania games that I would say are definitely design flaws to work around: It's so confusing when you lose your progress either by losing a save file or not getting to a save point in time. Whenever that happens to me I enter into this extremely anxious state where I can't remember what I did before I saved and what I have to do all over. It's like a quantum state and sometimes it gets me really stuck on puzzles. Especially because players usually will never try to do something twice if they think they already did it. Cool! Glad you're enjoying it. And yeah that's definitely a frustrating thing, having to repeat stuff and even worse forgetting which things you have to repeat. I got tons of anxiety in Majora's Mask the first few times I played it forgetting what heart pieces I got and rechecking each place over again. I'm not sure there is any way around those flaws but most of the time I can put up with that kind of stuff if I'm liking the game enough. It's actually well written and compelling. Like, the thematic implication that the monsters in the game are actually fighting you because their reality collapses if the dream stops. Legitimately haunting. Yeah the game's story is very cool, I didn't want to spoil the dream aspect when I described the game earlier so I'm glad you got far enough to experience all of that. Have you beaten the game yet? I've been a bit sick lately so I haven't been on for a while but I've still been working on the game in the meantime! You'll start in a mossy cave like location. I might add some sunlight coming through and animate the water a little bit. And I'm still not sure if I like the cliff walls yet. The outdoor gif is a wip so it's a bit empty for now but I wanted to show the snake statue/temple. 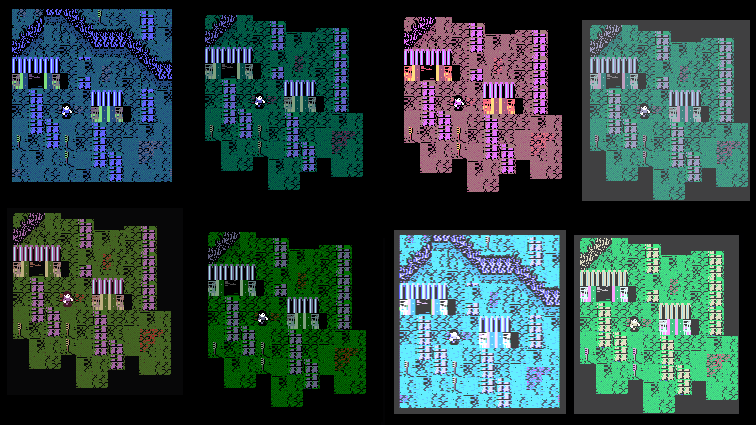 Plus it's not as tiled or blocky as other things so it seems a bit too detailed. Not everything is completely blocky anyways but I'm trying to find a good balance with the graphics to maintain the subtle abstractness. For now though I'll probably keep it out of the game. Yeah I beat it. Good stuff. Quick update to show what I've been working on. It's the inside of the snake statue. I've made many many variations of this place, still trying to figure out how I want it to look. The original one from the previous version of the game was going to be something like this so I might go back and tweak it some more with this in mind. So I'm going to try jumping back into this along with two other small prototypes I've been working on lately. I recently started playing the nes version of Super Hydlide for the first time which has been really interesting to see and has helped me get back into working on this game. The palette will change between these two colors in this area. I think the green and blue looks kind of morning like but the yellowish one could be a sunset, also either one could be mid day so I'm not sure yet what order they'll cycle. the structure in the lower left is an entrance to the underground town which you'll start in. I'm going to try updating some of the art for the underground sections next. Nice, glad to see work continuing on this. Will the day night cycle be purely aesthetic, or will it have an impact on gameplay? I was thinking just aesthetic. Maybe some different monsters at night or something could be cool. I could also make it so the player needs to sleep after a certain amount of time, although I'm not sure I'd want things like that to complicate the gameplay too much. Some wip stuff for another area in the game.